GymWorld Marin offers Mid-winter Break camps in San Rafael. Looking for something fun for the kids to do over the upcoming mid-winter break? 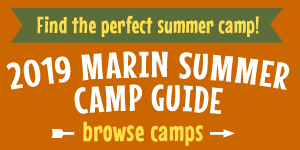 Check out some of the great day camps (and drop-in options) here in Marin and the Bay Area. All the camps listed below offer drop-in camps, too. 23 Elephants is offers a mid-winter camp, "Songs of Matilda" for ages 5–9. Sing, dance, play, and experience the magic of theater! For more info, call (646) 241-7734 or visit their website. Andrews Camp offers a fall and winter break camps that includes outings to Scandia, Rebounderz, Six Flags, games, crafts, sports and more. Bring lunch and snack. For more info,call (415) 446-8946 or visit their website. The BADM is offering winter Discovery Camps provide child-directed, inquiry driven learning through project-based, hands-on activities designed to intentionally boost creativity, STEM skills, and critical thinking. Children come away with the skills and tools to support lifelong discoveries. For more info, call (415) 339-3900 or visit their website. Camp Funderblast is a fun, local day camp that helps kids thrive! Swimming, arts and crafts, cooking projects, nature hikes, games and more. Located 50 Underhill Road, Mill Valley. For more info, call (415) 843-1730 or visit their website. Kids will learn gymnastics on floor, beam, bars, trampoline, and ault. They also have a tumble-trak, foam pit, climbing wall, ropes and rings. Campers will learn in groups of 8 students or less per coach, according to age and skill level. For more info, call (415) 482-8580 visit their website. In this Mixed Media camp, Little Artists will learn how to draw their self portrait from a photo taken in studio using correct positioning and ghost lines. The drawing will then be ‘painted’ with magazine color cut outs to create a portrait collage. For more info, call (415) 295-7037 or visit their website. They offer a half-day or full-day camp for ages 3 and up. For more info, call (415) 257-6342 or visit their website. Marin Treks' Winter Adventure Camp are full-day camps that travel to exciting destinations throughout the Bay Area. For more info call (415) 250-0988 or visit their website. Campers will enjoy their Winter Break participating in winter games, themed crafts, park time, and sports. Parents can pre-register for drop-in days. For more info, call (415) 479-0775 or visit their website. Mill Valley Recreation is offering fall and winter break camps. Children are able to unplug from technology and gain resiliency. The kind of encouragement and nurture kids receive at Camp makes it a great environment to endure setbacks, try new (and maybe a little frightening) things, and see that improvement comes when you give something another try. They are a way to foster new friendships, or make enduring memories with old ones. For more info, call (415) 383-1370 or visit their website. Morning Star Farms is offering a winter camp that offers riding lessons, horse care, grooming & saddling each day and other horsey activities. For more info, call (415) 897-1633 or visit their website. MV Code Club is offering a fall and winter break camp that teaches kids coding, game development, web development and more. One-day drop in coding camps available, as well as a full-week Minecraft camp. For more info, visit their website. Novato Gymnastics is offering a winter break camp. Kids will learn gymnastics skills, develop strenghth and flexibility, winter-themed crafts and more. For more info, call (415) 899-8279 or visit their website. The Osher Marin JCC offers Mid-Winter Break Camp with arts and crafts, swimming, sports, science, cooking, music, and more. For more info, call (415) 444-8000 or visit their website. A two-day cooking camp (Feb. 19–20) for ages 10-14. We'll concentrate on dishes from Greece, Armenia, the Middle East and North Africa. Cost: $300. For more info, contact Adrianna at (415) 332-4352 or visit their website. Play-Well Marin is offering a fall and winter camp with some hands-on LEGO camps: Jedi Adventure Game, JediCraft Survival Game, Jedi Engineering, Intro to STEM with LEGO and many more. For more info, call (415) 460-5210 or visit their website. Can’t go skiing? Build your own ski lodge with slope so you can take your Poekies skiing at home! We’ll create it just like our regular Poekie houses, but with extended ski-slope, and of course, skis for your Poekies! Email or call to register: sophia@poekienook.com. Event details. These fall and winter camps the Rolling Hills Club will preview all the excitement and fun of their Sports and Splash Camp. Each day will feature one amazing summer camp theme, such as Mad Science Monday, Tie Dye Tuesday, Wizard Wednesday and more. Campers will enjoy various activities, fun games, swim, sports, and arts and crafts. For more info, call (415) 897-2185 or visit visit their website. Studio 4 Art offers fall and winter camps. Each day will be filled with creative excitement! Dabble in a bit of everything Studio 4 Art has to offer. Exploring painting, drawing, ceramics, mixed media and printmaking, students will create a variety of fine art projects in different art mediums. Professional artist/teachers will introduce students to new and contemporary art techniques, procedures and processes. For more info, call (415) 596-5546 or visit their website. Terra Marin School in Mill Valley offers a Earth Discovery Camp from February 18–22. What if your days were spent exploring nature through the eyes of an owl, practicing the age old art of archery and taking a dip with your friends in a fishing hole? Some may call that a ton of fun, while some others might say it’s a crafty way to help kids develop life skills and encourage a passion for learning. Join us for this exciting camp where kids will engage their minds and their bodies in activities that stretch their physicality and imaginations, connect them with the environment and bond them with their campmates in a very special way. For K–8. For more info, visit their website. This entertaining excursions camp offers lots of fun for kids ages K–7. The camp will travel to a new location each day: mini golf, The Marine Mammal Center, movie day and a BBQ at Paradise Park. Register online here. Vilda Nature Camp is offering a Winter Break Camp. Younger campers ages 4–6 will look for spring wildflowers, hidden treasure, play games and sing songs at a half-day camp. Older campers ages 6–9 will kayak and practice tracking and nature exploration skills. For more info, call (415) 747-4840 or visit their website.